Mind Vector is a powerful mind mapping software that grants users the power to gather and uniquely present concepts and ideas. It’s a highly potent tool designed to simplify mind mapping and is a great fit for education domain, knowledge management, project management domain, etc. The platform offers the smartest way to organize thoughts with robust technique and brainstorming capabilities to visually manage important information. In addition, Mind Vector serves as an advanced tool for planning, learning, decision-making, and problem-solving. The software is available for both on-premise and cloud-based deployments and works well on any device including Windows, Mac, IOS, and Android. It comes with some of the best features to help users map out the whole thought process in few clicks. Some of these features include Mind mapping, idea management, share on social media, import CSV files, collaborate, and ubiquitous. 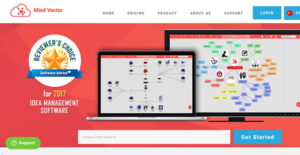 Mind Vector is an innovative software built for collaborative mind mapping. It’s an ideal solution that takes care of all your mind mapping needs including brainstorming, decision-making, visual thinking, and problem-solving. The platform is easy to use, thanks to its three unique visualizers that permit you to create mind maps anywhere anytime and interactively present data. Also, the highly effective web tool permits you to enjoy the benefits of mind mapping provided you have internet access. One notable advantage of Mind Vector is that it allows mind mapping in mixed reality. The solution integrates seamlessly with Microsoft Hololens to bring an innovative dimension to mind mapping. It augments 3D mind maps with the actual world to bring a feeling that’s more immersive than the customary way of visualizing mind maps. In addition, the Mind Vector cloud is a secure cloud storage location. The cloud storage is a reliable place to archive all mind mapping data and is exclusively available to platform users regardless of the device they use. Whether you are using the web-based app, Mac, iPad, iPhone, or Android device, Mind Vector offers 50MB of cloud space without any limitation for collaboration. Mind Vector’s visualizer mode allows you to arrange nodes radially to come up with visual presentations of mind maps. It permits you to create mind maps by incorporating nodes to ideas in a chronological format. The mind maps can begin with the root node and connect other child or sibling nodes with ease to expedite ideation. Then using the center map mode, you can resize these maps and place the main node at the center without a hassle. If you are considering Mind Vector it might also be a good idea to check out other subcategories of Best Mind Mapping Software collected in our base of SaaS software reviews. Since each enterprise has unique business needs, it is advisable for them to refrain from looking for a one-size-fits-all ideal software solution. Needless to say, it would be pointless to try to find such an app even among popular software solutions. The clever thing to do would be to jot down the various essential elements that need consideration such as key features, finances, skill levels of employees, company size etc. Then, you should do your research thoroughly. Read some Mind Vector reviews and check out each of the other systems in your shortlist in detail. Such in-depth homework can make sure you reject ill-fitting systems and zero in on the system that provides all the features you require for business success. How Much Does Mind Vector Cost? We realize that when you make a decision to buy Mind Mapping Software it’s important not only to see how experts evaluate it in their reviews, but also to find out if the real people and companies that buy it are actually satisfied with the product. That’s why we’ve created our behavior-based Customer Satisfaction Algorithm™ that gathers customer reviews, comments and Mind Vector reviews across a wide range of social media sites. The data is then presented in an easy to digest form showing how many people had positive and negative experience with Mind Vector. With that information at hand you should be equipped to make an informed buying decision that you won’t regret. What are Mind Vector pricing details? What integrations are available for Mind Vector?